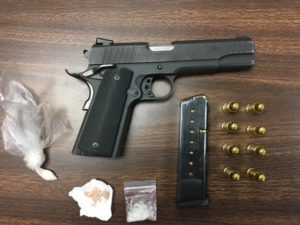 Kalamazoo, MI: On August 23, 2017, Kalamazoo Department of Public Safety (KDPS) officers, in response to numerous drug/weapons related tips provided by citizens in the 1300 block of James St, conducted a traffic stop on a vehicle in the area of Egleston Ave and James St. Officers had contact with the occupants and arrested a passenger of the vehicle on an outstanding felony warrant. The subject, a 22 year old Kalamazoo resident, resisted arrest and suspected methamphetamine was located on his person. A search of the vehicle revealed a loaded, 9mm handgun. A second occupant of the vehicle, a 44 year old resident of Kalamazoo, was arrested for CCW and felon in possession of a firearm. Following the traffic stop, officers conducted a surveillance operation in the 1300 block of James St while a drug search warrant was drafted. The search warrant was ultimately signed and executed. Officers located six adults and one child inside the residence including two males with outstanding warrants for felony drug and weapons violations. A search of the residence revealed heroin, methamphetamine, and marijuana. 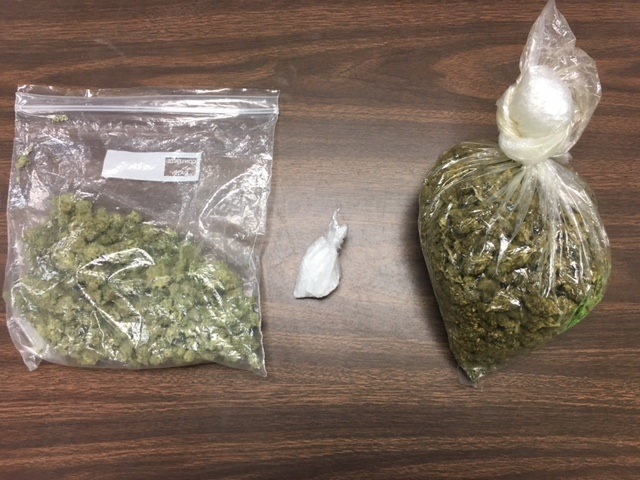 One suspect, a 38 year old Kalamazoo resident, was arrested and lodged at the Kalamazoo County Jail for possession of heroin, possession of marijuana and maintaining a drug house. Another suspect, a 31 year old Kalamazoo resident, was arrested for possession of methamphetamine, possession of marijuana and maintaining a drug house. Kalamazoo Public Safety officers will be submitting drug related charges on the additional suspects in the case. Kalamazoo Public Safety officers were assisted with the gracious and vigilant support from citizens. This incident was investigated and solved rapidly with their immense and appreciated help. The Kalamazoo Department of Public Safety is fully committed in ridding the streets of dangerous criminals who affect the quality of life in the neighborhoods. This is a shining example of a community based partnership to aid in the goals of keeping the streets of Kalamazoo safe for all who live in our great City.